ps. I loved your last dress in red satin! I know you will make a great job of it. your valentine dress was very special. Did you know that there is a new period drama starting on BBC1 at nine O'clock tomorrow evening.It is called South Riding and is set in 1934. I am sure you would enjoy it. That's lovely! Very, very classy. Lovely pattern can't wait to see the results. I want to tackle some 30's patterns soon but I know the instrictions are usually more vague and they assume you have lots more knowledge that I probably lack. I'm still working on Simplicity 5408 - the red dot dress. I'm a really slow seamstress. :) I plan on making the Kate Jeans and a stripey knit top for MMMarch. 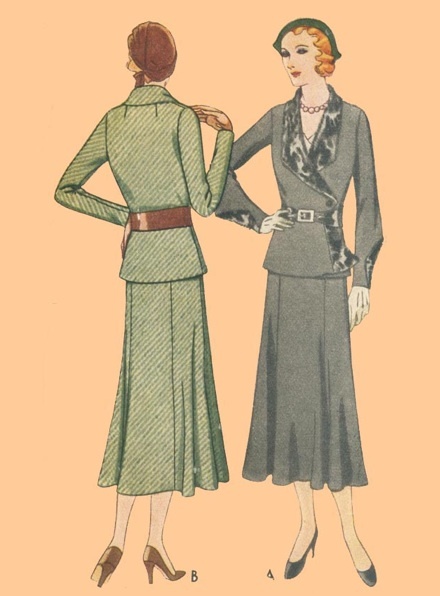 I just finished a house dress with the same style collar as this! I love the shape and way the wrap front fits. I'm looking forward to seeing this outfit finished! That is gorgeous! Can't wait to see it made up. I am working on... well, coursework. No sewing right now. I have been tinkering with a dress pattern, trying to work out how to do a FBA on it to make it fit... and I am thinking about making a nice easy summer sundress for my daughter. But it's the term paper that is calling me right now! (that and preparing to potentially move to the States... wow.) I am sewing vicariously through blogs right now! Gorgeous! I'm knitting a sweater from 1936 right now; I need to take a garment-construction class if I can find one around here. (And I need to clean up my craft room so I actually have room to sew.) Can't wait to see how it turns out! Right now I'm mostly finishing up that Swing Dress and figuring out if I want to make a matching belt or white linen one to wear with it. ;) I'm also starting to gear up to make a 1910s blouse from some Swiss Dot I picked up last week. Oh, and I really need to finish some cushion covers for the sofa this week too! Ooh! That's going to be lovely! Green crepe paired with a 30s rayon print I've been hording for years. I better hurry if I want to make the contest deadline. hehe.